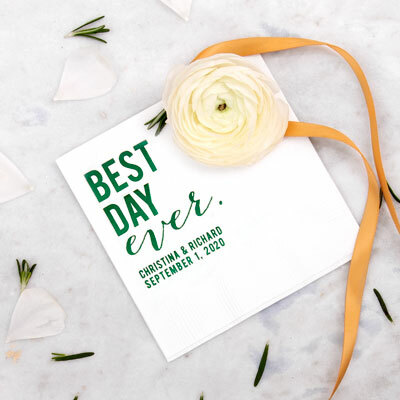 Planning your entire wedding can be a daunting task, but as long as you stay organized and tackle one thing at a time, it can be so rewarding! We’ve created a Wedding Planning Checklist to help make your wedding day perfect and stress-free. Print it out and use to assist your wedding planning or read below. Happy planning! [ ] Celebrate with your loved ones—you're engaged! [ ] Determine your budget. – Speak with your fiancè and family to work out contributions and personal finances. [ ] Choose the style/theme/color palette of the wedding. [ ] Pick (and ask!) your wedding party. [ ] Schedule engagement photos. [ ] Start compiling the guest list. [ ] Research venues for the ceremony and reception. – Caterers, musicians, photographers, videographers, planner, etc. – Find endless wedding inspiration on Pinterest. You can create a board to share with any close friends and family who you want on your planning team. [ ] Research wedding dress styles and plan a shopping trip! [ ] Create a wedding website. – The Knot, Wedding Wire and Zola are a few great options to look into. [ ] Book your wedding venues—both ceremony and reception, if they're at different locations. [ ] Book desired vendors. [ ] Research wedding florists. [ ] Purchase wedding dress and veil. [ ] If being fit for your big day is a priority for you, now's the time to establish a wedding fitness routine! [ ] Finalize the wedding guest list. [ ] Research hotels near your venue and reserve a block of rooms for out-of-town guests. [ ] Choose bridesmaid attire and accessories. [ ] Register for gifts. Usually, your wedding website will offer a place to create a wedding registry as well! [ ] Book a florist. [ ] Research hair and makeup styles for your wedding day and book your stylist. – Consider booking a trial run as well if you are wanting an intricate hair-do. [ ] Meet with your officiant and start planning the ceremony. [ ] Start planning your honeymoon! [ ] Choose groom and groomsmen attire. [ ] Book day-of transportation for the wedding party. [ ] Purchase wedding bands. [ ] Book rehearsal dinner venue. [ ] Research wedding invitation designs. [ ] Order your wedding invitations. [ ] Order a wedding cake—or cakes! We love the traditional cake alongside a funky groom's cake. [ ] Book lodging for your wedding night. [ ] Book honeymoon travel and lodging. [ ] Decide on the look for bouquets and floral arrangements with your florist. [ ] Plan wedding welcome bags for out-of-town guests with unique local items they'll enjoy. [ ] Schedule dress fittings with your seamstress. [ ] Put together a playlist (including a do-not-play list!) for your DJ or band. 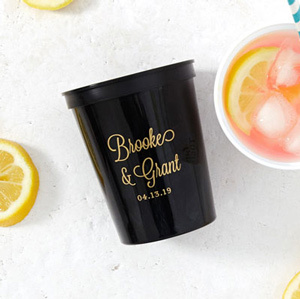 [ ] Order personalized wedding favors! [ ] Finalize the timeline for your ceremony and reception. Here's our recommended Wedding Reception Timeline to get you started. [ ] Purchase wedding dècor and accessories. – Such as table numbers, place cards, the ring bearer pillow, flower basket, vases for bridesmaid bouquets, etc. [ ] Order gifts for the bridal party, parents and each other. 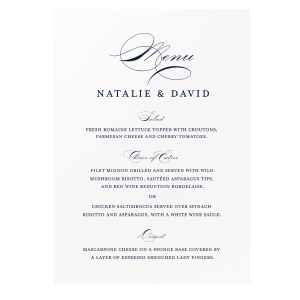 [ ] Finalize the reception menu with your caterer. [ ] Order menu cards. [ ] Order rehearsal dinner invitations. [ ] Develop a system for organizing RSVPs. [ ] Begin writing your vows. [ ] Review ceremony details with the officiant. [ ] Decide on content for wedding programs. [ ] Apply for a marriage license. [ ] Finalize day-of timeline. [ ] Finalize seating arrangements. [ ] Finalize fittings and attire for the wedding party and your parents. [ ] Create a day-of schedule the distribute to vendors. [ ] Decide how to integrate "Something Old, New, Borrowed and Blue." [ ] Book beauty treatment for the bridal party. 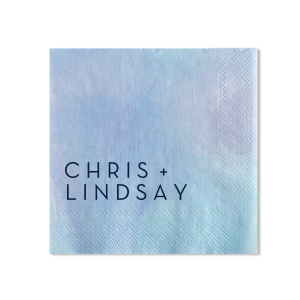 [ ] Order personalized cocktail napkins, cups and stir sticks from For Your Party. [ ] Final dress fitting. [ ] Confirm honeymoon reservations and pack for paradise! [ ] Check in with vendors to confirm the date, times and location. Provide them with the day-of vendor schedule. [ ] Pick up your marriage license. [ ] Order thank you notes. [ ] Delegate wedding day set-up and clean-up duties. – Such as the gift table, guestbook, tux returns, any other rental return, etc. [ ] Start breaking in your wedding shoes! [ ] Follow up with any guests who haven't RSVP'd. [ ] Give the final headcount to your caterer. [ ] Make arrangements for and needed pet care during your wedding day and honeymoon. [ ] Make sure the band or DJ has your playlists. [ ] Get a final haircut and color. [ ] Have final payments and cash tips ready for all vendors. [ ] Provide any readers with the necessary scripts. [ ] Deliver a must-have image list to your photographer and videographer. [ ] Make sure everything is laid out and packed for the big day. – This includes your gown, shoes, the rings and marriage license. [ ] Deliver wedding welcome bags to the hotel. [ ] Get a mani/pedi. [ ] Attend the wedding rehearsal. [ ] Enjoy your rehearsal dinner! [ ] Get your beauty sleep—don't stay up too late! [ ] Eat a healthy, hearty breakfast. [ ] Give the Best Man your wedding rings and officiant fee. [ ] Take a deep breath! Relax and enjoy the day you've spent so much time planning. [ ] Enjoy your honeymoon! [ ] Send thank you notes to guests and particularly helpful vendors. [ ] Live happily ever after and enjoy your marriage!